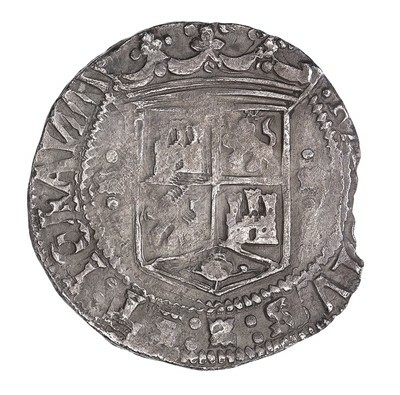 Obverse: :KAROLVS:z:ET:IOhANA:R (reverse-barred N in IOhANA) - Crowned arms of Castile and Leon; M - M (gothic M); annulet above and below each M.
Reverse: z:hISPANIE:z:ET:INDIARV:M:. (reverse-barred N in hISPANIE and INDIARV . 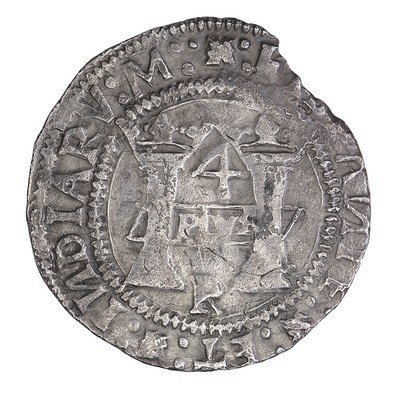 (M is Roman, replacement letter; z is a squarish emblem punch, possibly an "alef") - Crowned Pillars of Hercules; PLVS between, in overlapping rhomboid panel slanted left; 4 above.